I read Oh Crap Potty Training before potty training both of my 25 month old daughters, and this method worked beautifully with both of them. I cannot recommend it enough, especially if you have a weekend set aside that you can devote to and dive right in. 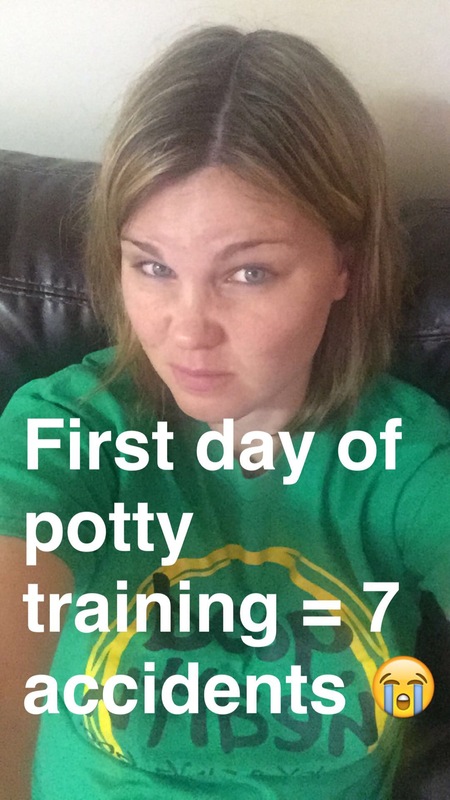 Read on to hear about how the first few days went with potty training our first daughter. I’m excited about the year ahead, starting today hopefully with a phone call from my babe! He’s been off training for the last six days and away from the phone, so Hadley and I are really hoping we’ll get to talk to him and FaceTime later! The biggest news I have to fill him in on… POTTY TRAINING. It’s underway, folks. I picked Wednesday, December 30th as THE BIG DAY to start potty training Hadley for a couple main reasons: 1.) our holiday travels would be over & 2.) nearly all of our normal routines would be out of whack anyway (no preschool for another week, many friends out-of-town, temperatures outside are freezing, etc.). Basically, if there is ever going to be a good time to potty train, this was as good as it’s gonna get. 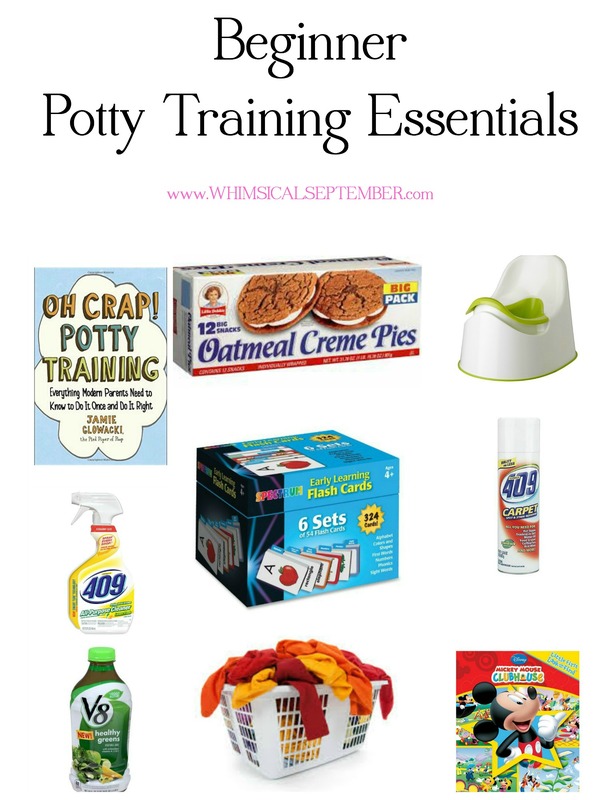 In case you’re interested in just skimming this post and possibly saving it for later when it’s your time to potty train your little one(s), here have been our potty training essentials so far. And by essentials, I really mean ESSENTIALS. Every one of them. And here’s a quick summary of how things are going. Accidents: two | Successes: way too many to count! I’ve been reading Oh Crap Potty Training on and off the last couple of weeks as a guide for how to potty train, which is very unlike me because I’ve chosen to basically wing every single big transition we’ve made with Hadley so far (much more my style – ha). I just knew I needed some kind of plan for how to make this as painless as it possibly could be considering I’d be doing it alone without Jamie and without wine at the end of the day. 😉 I highly recommend this book. I took off Hadley’s diaper as soon as she woke up. I gave her an excited pep talk about what today meant, and then her naked booty sprinted down the hall. The plan is to keep her with pants and underwear off completely until she gets in a good routine of using her potty chair. For the first 15 minutes she refused to sit on the potty, so I got out my bribing tool (oatmeal cream pies which I picked up as a brand new treat for her) much earlier than I intended and decided to give her a small piece just for sitting on the potty. It worked. For the next hour I panicked about her going to the bathroom all over my carpet and upholstered couch, so we decided to camp out in the basement where there is a leather couch (easier to clean God forbid she pee on it) and carpeting that’s old and needs to go anyway! I had just brought down and organized all of her toys the day before anyway, so she was excited to hang down there. The plan: I would set my alarm in 15 minute increments and walk her to the potty so that she could go. I would also make sure she had liquids (green V8 juice heavily watered down) at all time so that she was going frequently. After she’d use the potty, I’d reset my alarm and continue all day. Basically, we were going to rock this. How it went: She’d sit on potty for 10 minutes without so much as a tiny leak, she’d get up, and 60 seconds later pee all over (she would usually just freeze and then look at me all guilty) while I’m shouting NO HADLEY NOOOOO while sprinting towards her, like that was going to help anything! I’d then channel the book advice I’d learned and calmly have a talk about using the potty and to try again. I’d reset the timer for 15 minutes, and five minutes later she would pee everywhere again. It was only 9:30 a.m. and I almost quit. 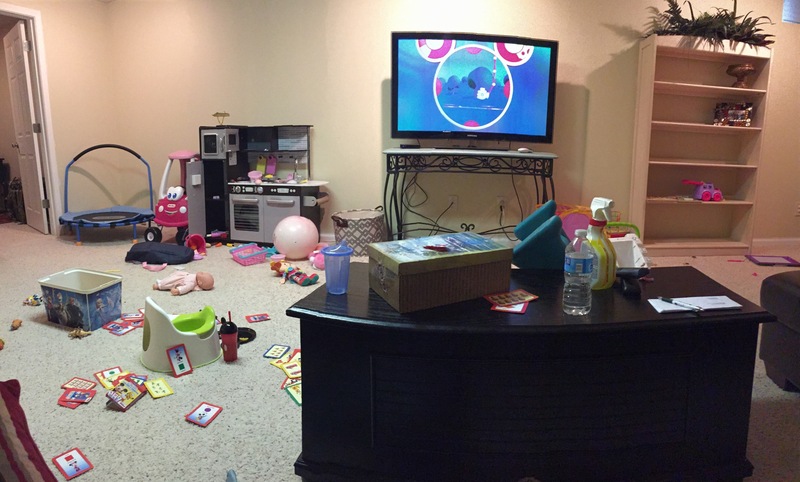 I’d barely had time to clean up the first mess, and now there’s another! I’d reset the timer again; 15 minutes later she would sit on the potty for 10 minutes without going, and then pee all over five minutes later. She had six accidents total by the time nap time rolled around at noon. It was a disaster and I’d officially labeled myself as the World’s Worst Potty Trainer just four hours in. She took a record-long nap (she was flat worn out too), and woke up at 3:50 p.m. I used nearly her entire nap time to scrub my floors and anything that came close to pee, and by the time nap time was over we were ready to try again. We camped out in the basement again while I continued to give her liquids and oatmeal cream pie bites for obeying. She had three successes right in a row (following by my hollers for joy and attempted toe touches to celebrate) followed by one accident. By 7 p.m. this mama was done. This is what my basement looked like last night. Hadley got a bath, we did her normal bedtime routine, and by 8 p.m. she was down for the count. WHAT. A DAY. I woke up at 6 a.m. and decided to get up and knock stuff out around the house before devoting another day to the torture that is potty training. At 7:30 Hadley was awake, so I took her diaper off, gave her a pep talk, and again watched her naked booty bounce down the hallway. The plan: NOT DIE and try not to panic when day two goes just as poorly as day one. How it went: BEAUTIFULLY…err… I mean, as well as day two could have gone! She looked for her chair as soon as she woke up and used it within 60 seconds of sitting down. I almost died of shock. At 9 a.m. I was on the phone taking care of something when I watched her walk over to her potty chair, sit down, immediately pee, and then stand up to clap for herself. I had to cup my hand over my mouth and try not to scream for joy while on the phone with an insurance representative. She had one accident while eating lunch and another while I was distracted doing the dishes, but otherwise she had no problem sitting down on the potty when I asked and then almost immediately going. She only sat down on it and went by herself one time; She still really needs me to remind her and walk her over. Day three’s challenge will be getting her to tell me that she has to go or walking to her potty on her own. Just like the Oh Crap Potty Training book said, I had to let her nutrition go out the window. She’s legitimately eaten six oatmeal cream pies in two days. I’m also not keeping the potty chair in the bathroom, which may be weird to some, but it’s working for us so far. I’ve been keeping it in the main basement living area, and she’s loved sitting on the chair and watching TV. Once she really gets the hang of things we’ll move it permanently to her bathroom, but for now I just need her to learn the basics! Once she masters doing #2 in the potty multiple times in a row, I’m planning to bring her to Target to pick out her own underwear. I want to fight the cabin fever and stay home as long as we can stand it to make sure she REALLY has this all down pat before venturing out and about. I really don’t want to go back to diapers except for nap time and bed time, but that’s a totally different beast we’ll address eventually (hopefully before the baby gets here). Today’s day three and we’ve already starting things off with an immediate pee in the potty! Wish us luck! Updated: Keep reading! Here’s how days three through six went after following the Oh Crap Potty Training method (spoiler alert: it went great!). I welcome your tips and encouragement as we move forward with all this Oh Crap potty training biz. Thanks in advance! 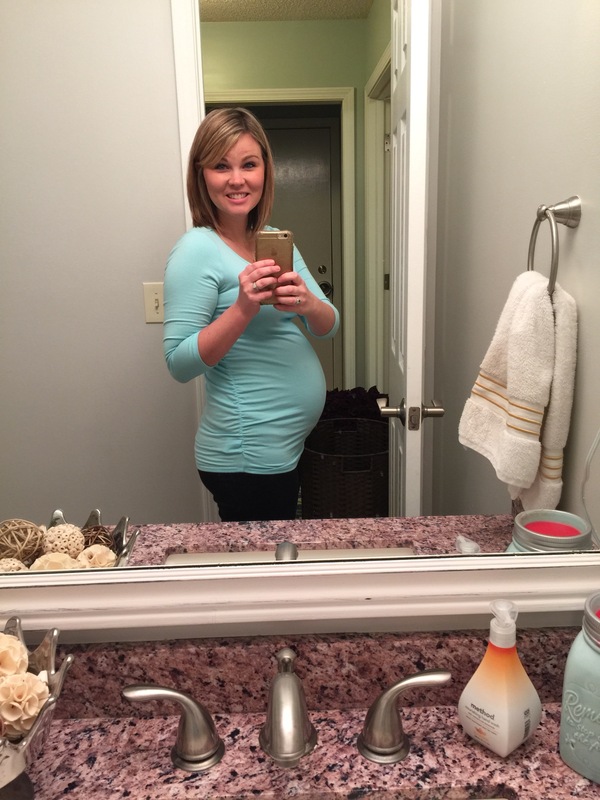 PS: Somehow I’m already 24 weeks along today! Only a few more weeks until I hit the last trimester. Hard to believe!